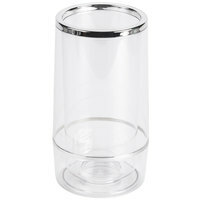 Keep your bottles of wine or champagne chilled to a desirable serving temperature with this clear acrylic wine cooler. 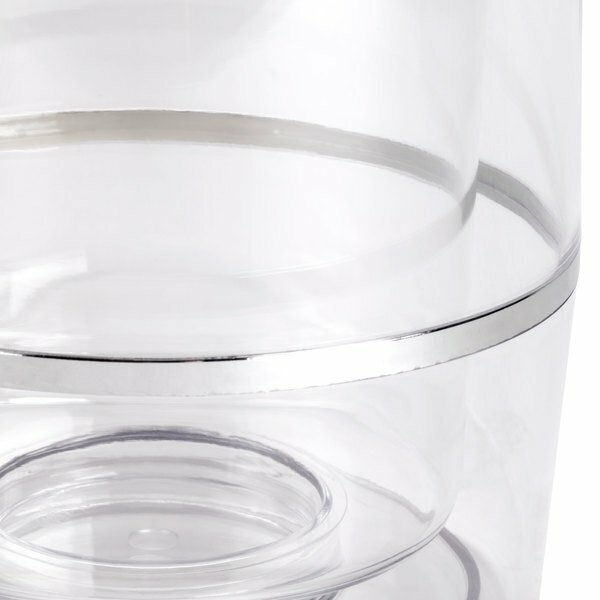 Always serve cold beverages by storing and displaying them in this stylish, insulated wine cooler. 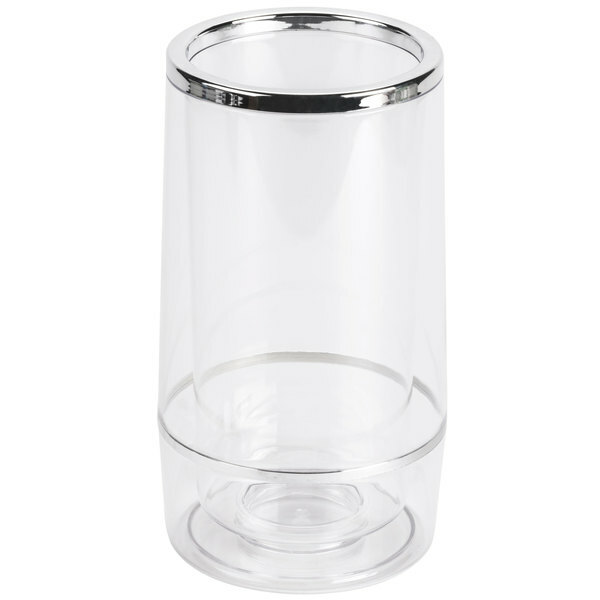 With a clear, durable design and a sleek, silver rim, the unit is perfect for your restaurant, bar, hotel, spa, or other beverage serving establishment. Wherever it's used, it 's sure to add a little extra to your guests' night out! 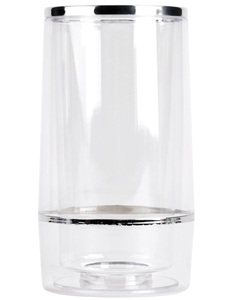 "Absolutely perfect for any bottle of red white or even sparkling or champagne. Say goodbye to polishing stainless and wobbly stands. These wine chillers are efficient cost effective and save space. Were about to order more at these low prices. Great product!" 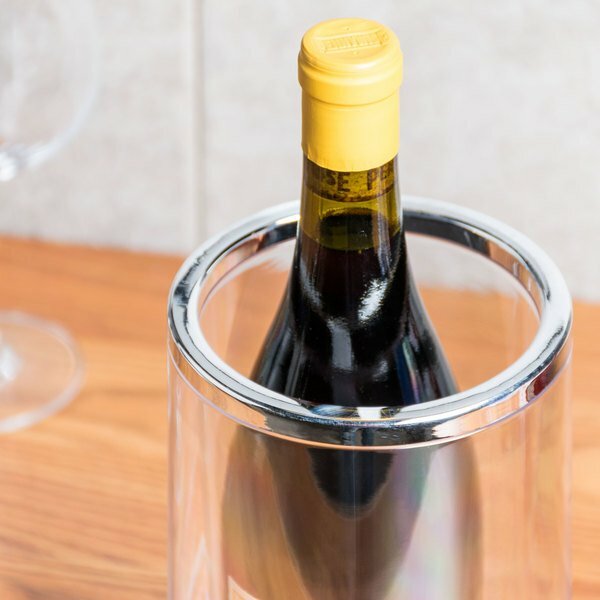 Made with a double wall construction, this cooler provides ultimate insulation to keep your cold bottle of wine cool for up to three hours, in standard temperature environments. Its acrylic makeup also provides optimal durability. 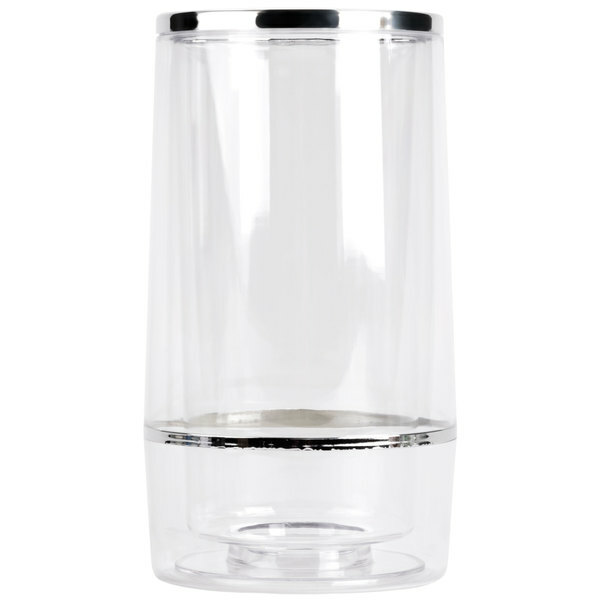 Virtually shatterproof and break-resistant, this cooler resembles glass without the high risk of breakage. 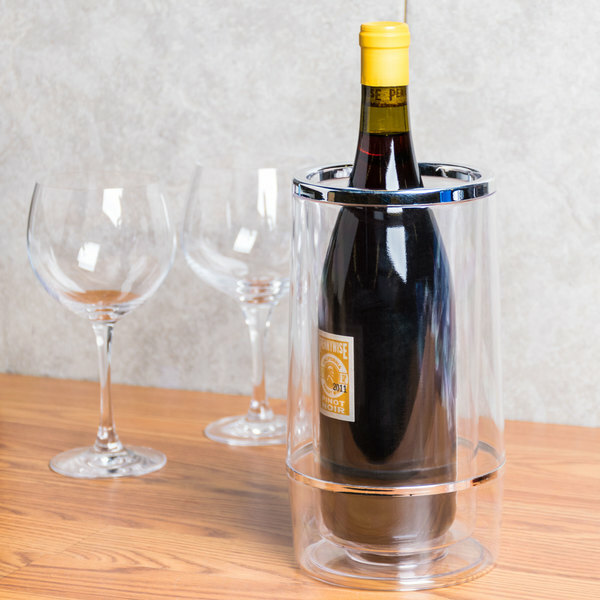 Its clear construction allows guests to see their bottle of wine, and lets servers see when supply is running low. 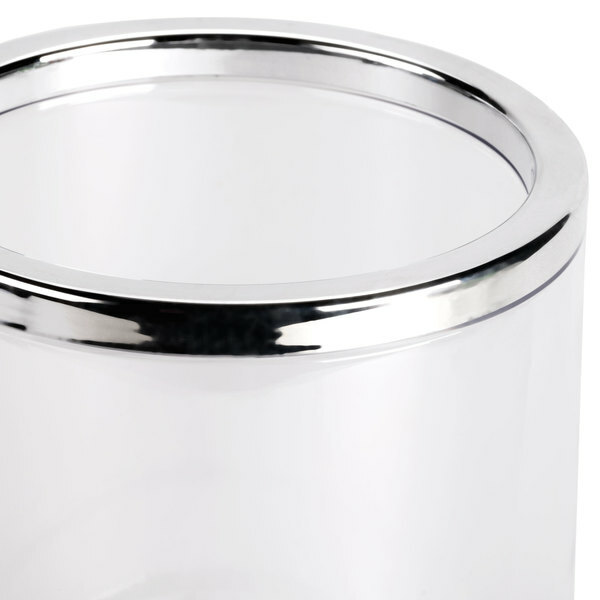 Plus, the cooler features a sleek, silver band around the rim, enhancing its elegant appeal to suit even your most formal events. These are ideal for wine if your wine is really cold. It will keep it cold for about 3 hours without the need for ice. However, if you wine is not chilled to maximum capacity it does not chill it. Ice would be needed at this point. We did however come up with a solution and we chilled the cooler first and it worked like a charm. 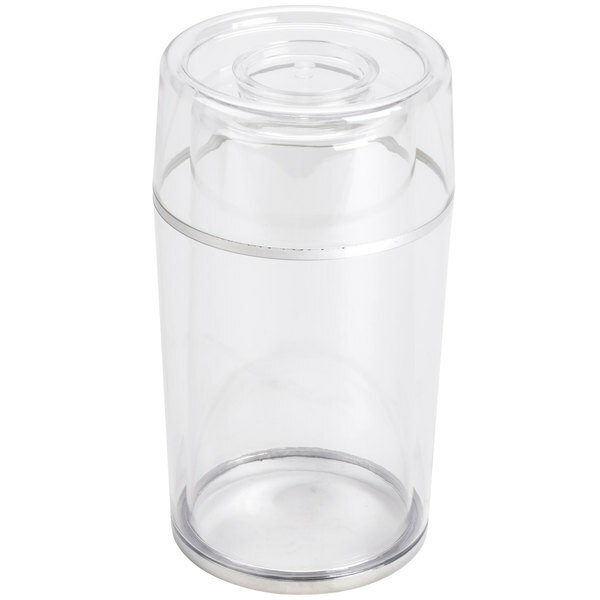 The Clear Acrylic Wine Cooler is well made and sturdy. It keeps wine and champagne chilled and it is eye appealing. This is great for special events. 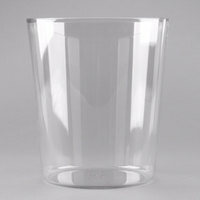 Absolutely perfect for any bottle of red white or even sparkling or champagne. Say goodbye to polishing stainless and wobbly stands. These wine chillers are efficient cost effective and save space. Were about to order more at these low prices. Great product! These work great for keeping bottles of white wine chilled. Fill the bottom with a little ice and the wine stay cold for hours, even outside. looking for a good looking wine chiller this is the answer. 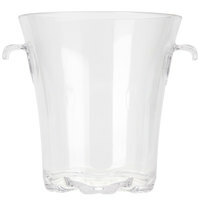 it is perfect for white wines for table presentation. We also use it for a tip jar! Classy look with an economical price point. I ordered six my first go-round and if wine sales climb, I'll have to order more of them. This wine cooler is Multi functional. It works extremely well as a wine cooler, but I have also discovered that it also doubles pretty nicely as a great looking tip jar. I like that it's clear so you can see what is being served. it has a nice sleek design to it. Great item, looks great on the tables and help me sell more wine! Does a great job of keeping the bottles cold and allows ice to slowly melt. Very happy with these wine coolers. 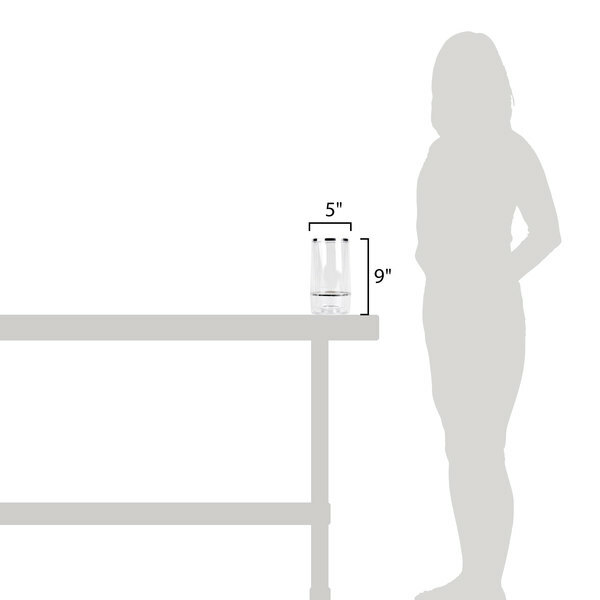 Very compact and fits on tables very well with out using ice buckets. I would recommend them to any restaurant. 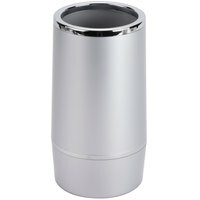 You can not beat the price for this great wine cooler! 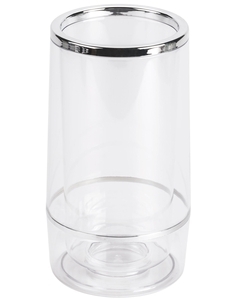 The clear acrylic material makes this easy to identify the wine without taking it out of the cooler! Keeps wine cold for hours!